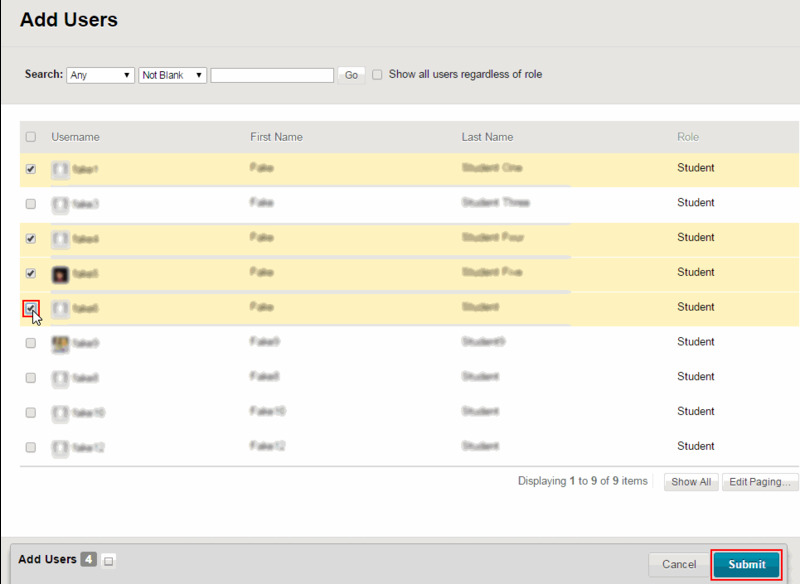 Instructions on creating, differentiating the types, and managing groups in Blackboard. 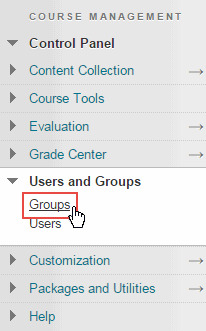 In Blackboard under the “Course Management” Control Panel, click Users and Groups. 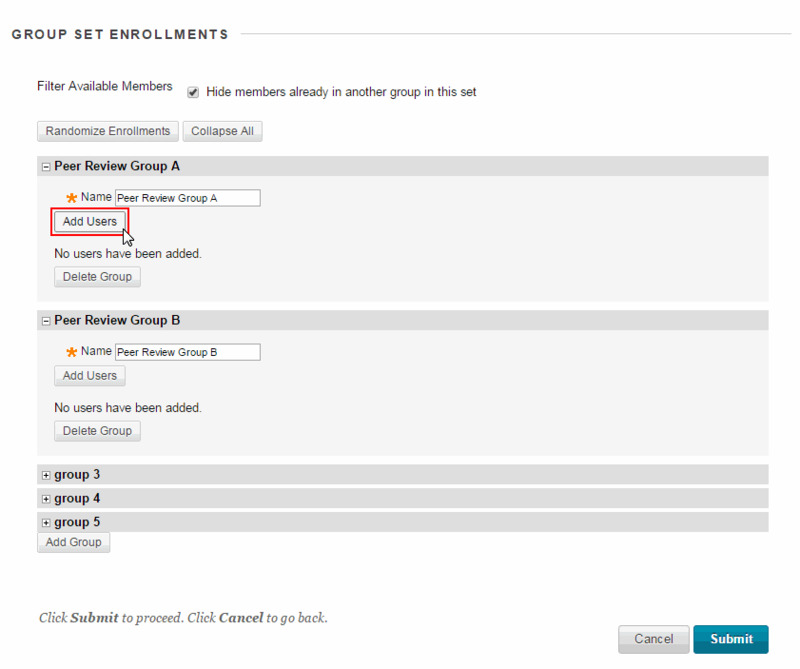 Single Group allows you to create groups one at a time while Group Set generates several groups at one time (recommended for multiple groups). Self-Enroll allows students to sign-up for groups. Manual Enroll allows the instructor to put students into groups. 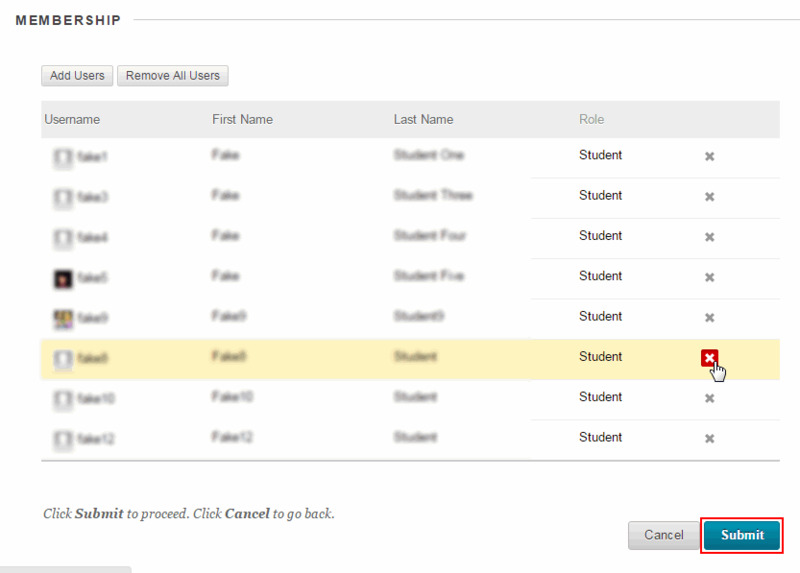 Random Enroll will randomly put students into predefined groupings. In the new “GROUP INFORMATION” page, complete the required fields. 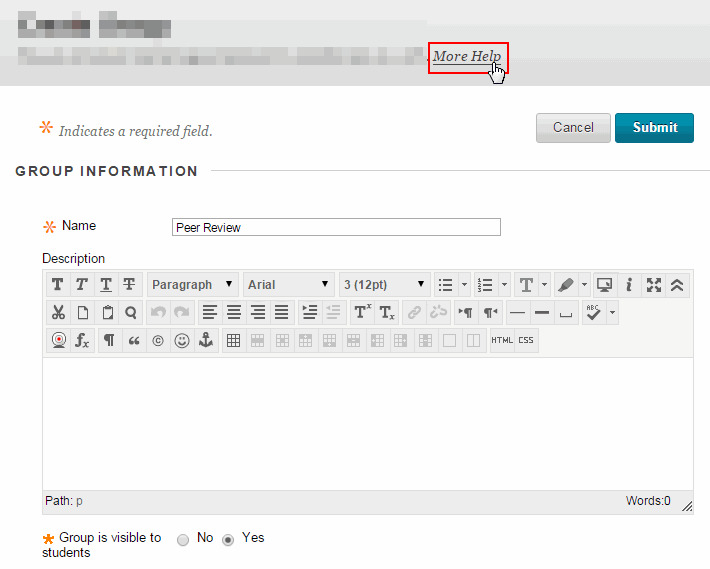 For detailed instructions on each field select More Help at the top of the page. To complete the group, add students. 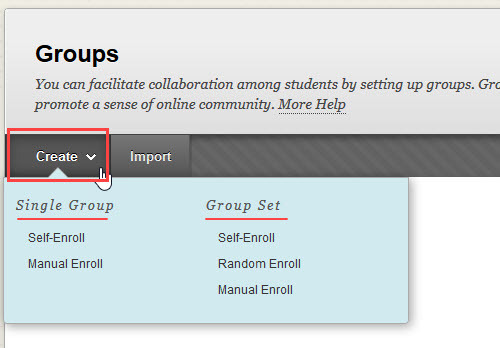 Note: When adding students to groups, you will encounter different steps in the “GROUP INFORMATION” page for different types of groups (see Step 2 above). The How to Add or Remove Students from Groups instructions will guide you through these differences. 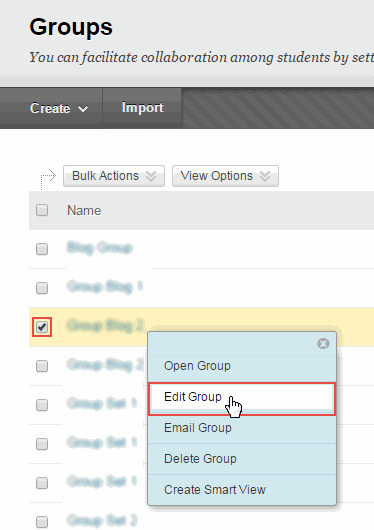 Complete the required fields in the “GROUP INFORMATION” page. For detailed instructions on each field select More Help at the top of the page. Scroll down to “MEMBERSHIP” and select Add Users. In the pop-up window, select users to be added. Click Submit when users have been selected. 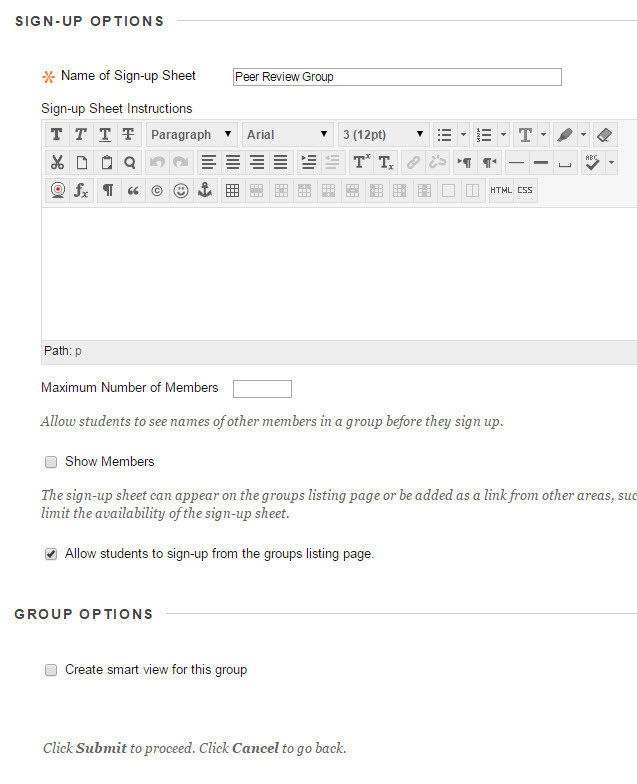 Scroll down to “GROUP SET OPTIONS” and add the Number of Groups. In the “Edit Group Set Enrollments” page, you can add users to each group set. Click Add Users under the desired group set to add users. Do the same for all group sets. Complete the required fields in the “GROUP INFORMATION” page. For detailed instructions on each field click More Help at the top of the page. Scroll down to “MEMBERSHIP” and complete the settings. 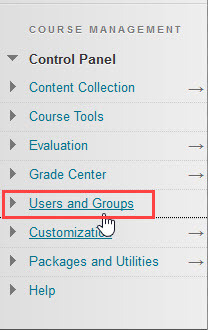 In Blackboard under the “Course Management” Control Panel click Users and Groups. Under Name hover next to the group you want to remove a user from, click the box, then select Edit Group from the drop-down menu. 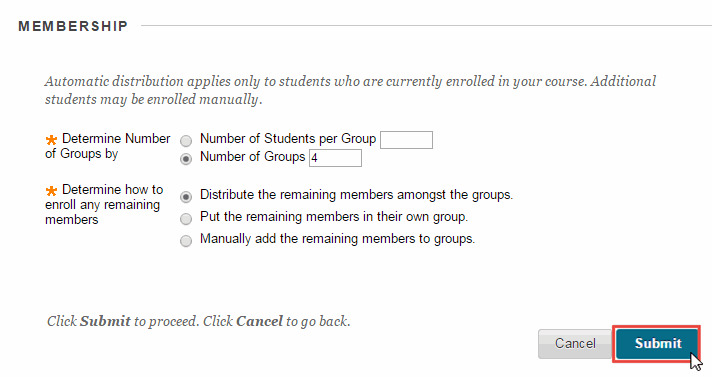 In the “Edit Group” menu, scroll down to “MEMBERSHIP” and click the X next to the student you want to remove.